A column is defined as a compression member, the effective length of which exceeds three times the least lateral dimension. Compression members, whose lengths do not exceed three times the least lateral dimension, may be made of plain concrete. A column forms a very important component of a structure. Columns support beams which in turn support walls and slabs. It should be realized that the failure of a column results in the collapse of the structure. The design of a column should therefore receive importance. A column is a vertical structural member supporting axial compressive loads, with or without moments. The cross-sectional dimensions of a column are generally considerably less than its height. Columns support vertical loads from the floors and roof and transmit these loads to the foundations. 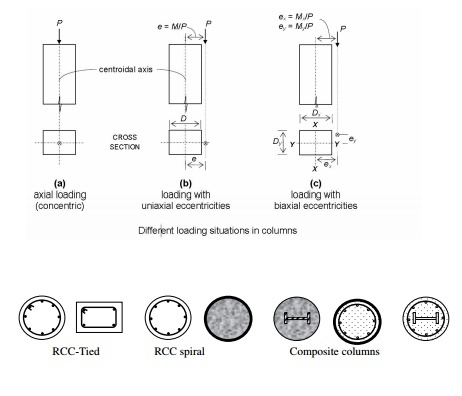 The more general terms compression members and members subjected to combined axial load and bending are sometimes used to refer to columns, walls, and members in concrete trusses or frames. These may be vertical, inclined, or horizontal. A column is a special case of a compression member that is vertical. Stability effects must be considered in the design of compression members. lex= effective length in respect of the major axis, D= depth in respect of the major axis, ley= effective length in respect of the minor axis, and b = width of the member. It shall otherwise be considered as a slender or long compression member. The great majority of concrete columns are sufficiently stocky (short) that slenderness can be ignored. Such columns are referred to as short columns. Short column generally fails by crushing of concrete due to axial force. If the moments induced by slenderness effects weaken a column appreciably, it is referred to as a slender column or a long column. Long columns generally fail by bending effect than due to axial effect. Long column carry less load compared to long column. Majority of columns in any buildings are tied columns. In a tied column the longitudinal bars are tied together with smaller bars at intervals up the column. Tied columns may be square, rectangular, L-shaped, circular, or any other required shape. Occasionally, when high strength and/or high ductility are required, the bars are placed in a circle, and the ties are replaced by a bar bent into a helix or spiral. Such a column, called a spiral column. Spiral columns are generally circular, although square or polygonal shapes are sometimes used. The spiral acts to restrain the lateral expansion of the column core under high axial loads and, in doing so, delays the failure of the core, making the column more ductile. Spiral columns are used more extensively in seismic regions. If properly designed, spiral column carry 5% extra load at failure compared to similar tied column.